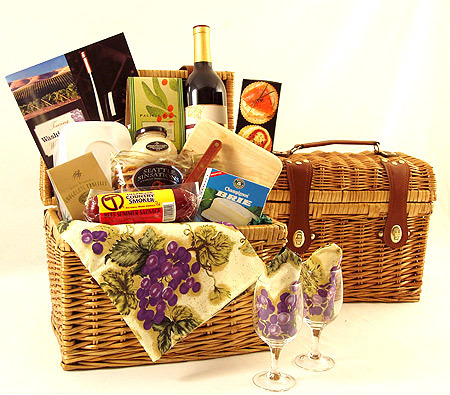 Tour the Washington Wine Country with this Gourmet Picnic Hamper Wine Basket packed for a great time touring the Washington & Oregon wineries and tasting rooms, summer concerts or a picnic in the park. Includes Columbia Crest Cabernet Wine, two wine glasses, a wine corker, a cotton tablecloth, two cloth napkins, a wooden cutting board and a serrated knife, a plastic storage container, Tillamook Country Smoker Beef Summer Sausage, Brie Cheese Spread, Elki Crackers, Seattle Sinsation Pretzels, A.J. 's Walla Walla Onion Mustard, Outrageous Offerings Chipotle Cashews and Seattle Chocolate Truffles. This Washington Wine Country Gift Basket will be enjoyed for many years! Available with wine, champagne or sparkling cider.